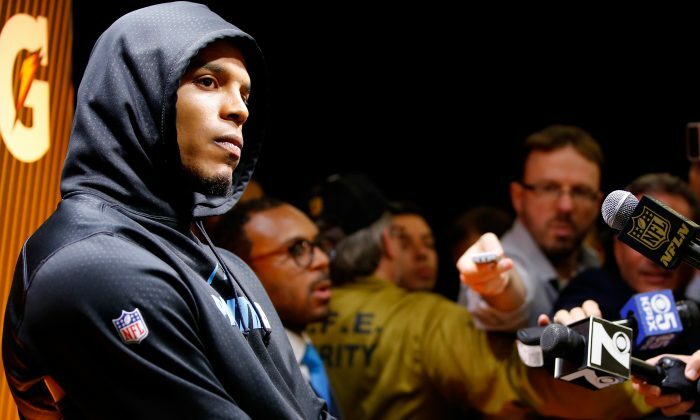 Carolina Panthers star quarterback Cam Newton hasn’t had the best week. First his favored team lost 24–10 in Super Bowl 50 to the Denver Broncos on Feb. 7. Then he was criticized by some for walking out of his postgame press conference after roughly three minutes. Maybe he just needed a good motivational speech from Andy Griffith to cheer him up and help him deal with losing. Of course it’s probably hard for someone like Newton to deal with losing given how successful he’s been. The first overall pick of the 2011 NFL Draft, Newton was a starter for just one year in college (Auburn 2010) and made it count. The 6-foot-6, 260-pound dual-threat quarterback won the Heisman Trophy while leading the 14–0 Tigers to a national championship. Through five seasons in the NFL, he’s lead the Panthers to three playoff appearances and one NFC Championship while bringing home the 2015 NFL MVP award. “Well I ain’t got no more tears to cry,” said Newton. Of course Newton has heard the comparisons to Russell Wilson who threw the costliest interception in Super Bowl history last year and then Peyton Manning who was on the wrong end of a 35-point blowout two years ago and how they still faced the media afterward. Newton, for better or for worse, isn’t Wilson or Manning. But at least one clever video editor thought it’d be funny to see him as Opie Taylor.